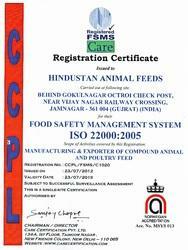 Established in the year 2008, we, “HINDUSTAN ANIMAL FEEDS”, (an ISO 22000:2005 certified company), are one of the prominent names engaged in Supplying, Distributing, Manufacturing, Exporting and Wholesaling a supreme quality range of Animal Feed & Poultry Feeds and Supplements. Our product range comprises Wheat Bran Pellet, Alpaca Feed, Bear Feed, Deer Feed, Game Bird Feed, Small Bird Feed and others. Moreover, we offer Beef Grower Feed, Beef Cattle Breeder Feed, Beef Calf Finisher Feed, Beef Cattle Feed, Beef Bull Feed, Quail Starter Feed, Quail Grower Feed and others. We formulate these products using highly nutritious, health boosting animal feed, which is made from quality ingredients such as cereal, grains, pulses, soy meal, essential amino acid, vitamins, and minerals that are procured from the most credible vendors of the industry. Offered feeds are highly regarded in the market as they provide nourishment to poultry, cattle, horses, camels, pigs and birds. Our offered feed is considered ideal for exclusive breeds such as Ostrich, EMU, Broiler, Turkey and Ducks. The offered animal and bird feeds produced by us is highly satiating and energizing. These products undergo strict quality checks so that we are able to offer a wholesome and rich feed, which is complete in all vital contents having high nutritional value. Our products are offered under the brand name of “Anupam”, which is a trusted and reliable brand that possess a perfect blend of latest technologies, sophisticated machines and highly qualified veterinarians and nutritionists to produce a range of wholesome animal fodder. We have gained immense expertise in the formulation of highly nutritious, health boosting animal feed, which is made under the strict guidance of our team of hard-working professionals. Under the immense guidance of our mentors, 'Mr. Mayur Keshwara, Mr. M.M. Keshwara and Mr. I.B. Keshwara', we have been able to cater to the varied needs of a vast client base. Their vast knowledge, expertise and experience in this domain have helped us to reach the pinnacle of success. With their sharp business acumen, leadership abilities, necessary guidance and knowledge, we have been able to achieve great heights. Our major export markets are East Europe, East Asia, Central America, North Europe, Middle East, South America, South/West Europe, South East Asia, North America, Australia/NZ, Indian Subcontinent, Caribbean East/Middle Africa, South/West Africa, North Africa. We are an established organization engaged in supplying, distributing, manufacturing, exporting and wholesaling a premium quality range of Animal Feed & Poultry Feeds and Supplements to our valued patrons. Offered feeds are processed using high grade ingredient that encompass high nutritional value and energy boosters. We are constantly guided by the principles set by our founder to achieve success in the animal feed sector. We strongly believe that when the customer benefits the business also prospers. Keeping this philosophy at the forefront, we created Anupam Vikas. It is a highly effective demand creation model aimed at providing customized solutions to the farmers for increased milk output. It has also helped them in enhancing productivity of the end produce. The successful initiative has made us one of the main leaders in this business. We are backed by a team of qualified professionals who have immense knowledge and experience of this respective domain. Our workforce is recruited only after stringent consideration so that they are capable in meeting to the diverse requirements of our patrons. Training sessions and seminars are conducted at our end at regular intervals to keep a constant check on their productivity. We have an experienced staff including qualified scientists and R&D experts. These experts constantly update us on the new and improved methods of processing the fodder in a more nutritious and wholesome manner. They incorporate the suggestions of our employees in various matters of quality improvement to attain maximum level of their satisfaction.